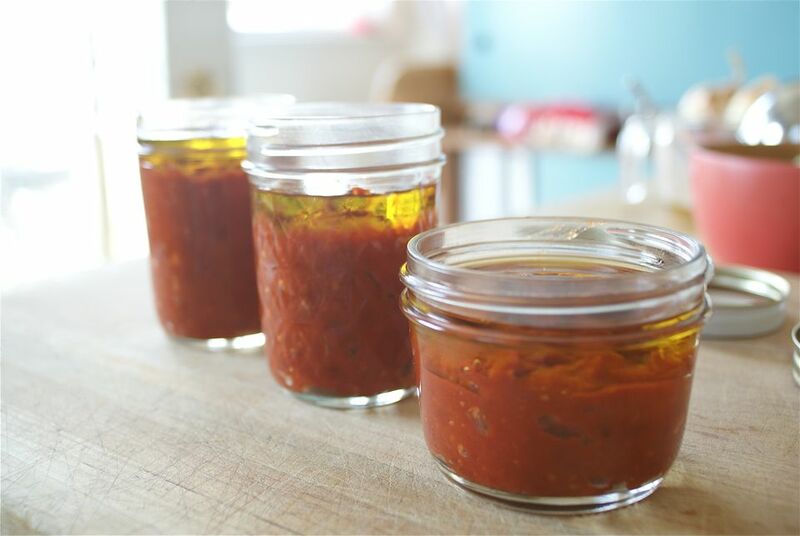 Homemade tomato paste—or if you're feeling fancy you can call it tomato conserva—is remarkable. It is thick, sticky, gooey, and sweet, and transmits complete tomato essence to whatever recipe you add it to. Plus, it's a great way to store a bumper crop of tomatoes in a compact, useful fashion. Use only the ripest (a bit too ripe is okay), sweetest, most delicious tomatoes you can find. Look for dry-farmed, vine-ripened tomatoes. Concentrated tomatoes like Roma or Early Girl tomatoes work extremely well in this recipe. If you use juicier tomatoes, be sure to follow the note on de-seeding and de-juicing them in the next step. There are additional ways to preserve tomatoes, including ​freezing them and canning them. If you want to reduce the paste in the oven, preheat an oven to 300 F (see Step 5 for more details). Remove and discard stems and any damaged parts from the tomatoes. Roughly chop the tomatoes and put them in a large pot. This can be a very rough chop—you just want to get the tomatoes started so they break down faster. Note: If you're working with tomatoes that contain a lot of juice, you might want to halve them and squeeze out and discard the seeds and watery juice in the center to help speed up the concentration process that will turn tomato purée into tomato paste. Bring the tomatoes to a boil over high heat. Cook, stirring, just until tomatoes soften, about 2 minutes. This brief cooking helps break the tomatoes down a bit and makes them easier to run through a food mill or sieve. Add about 1/2 cup of the olive oil and that teaspoon fine sea salt to the tomatoes. Note: If you have a tomato mill or food mill and a strong arm, you can skip this initial cooking step, if you like. Run the cooked tomatoes through a food mill or push them through a large sieve with a flexible spatula. Why are you doing this? To turn the tomatoes into a pulp while also removing the skins and seeds. Oven Method: If you started with not-too-juicy tomatoes and you have a few large sheet pans, you can directly pour the tomato pulp onto one or two large rimmed baking sheet(s) and bake in a preheated 300 F oven for about 3 hours. Combination Method: If your tomatoes were juicier or you don't have a large enough rimmed baking sheet, feel free to boil down the tomato purée on the stove first. Reduce it by up to 1/3 (or even 1/2 if your tomatoes were super juicy) by bringing it to a simmer and maintaining a steady simmer until the tomatoes have reduced. Then, you can pour this more concentrated tomato mixture onto a rimmed baking sheet or smaller roasting pan to finish reducing it in the oven. 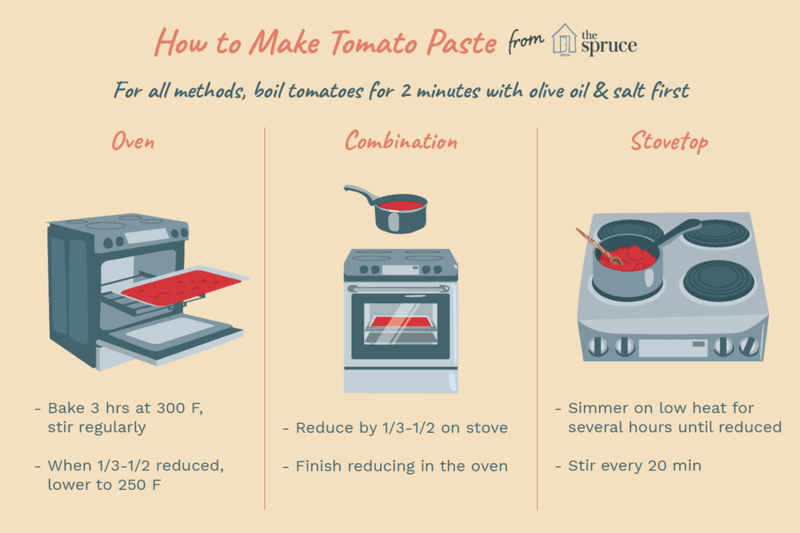 Stovetop Method: Reduce the tomatoes to a paste completely on the stove. While this is completely possible, it's a tricky business to get it to the right consistency without burning it. Better to make it in an oven, but if for whatever reason you want to just simmer it down, see Step 9 for a few tips. Whichever method you choose to reduce your puréed tomatoes, be sure to stir them frequently (every 30 minutes or so if they're in the oven; every 15 minutes or so if they're on the stove), taking care to scrape up any caramelized bits along the edges of the pan or bottom or sides of the pot and re-incorporating them into the mixture. After the tomatoes have reduced significantly (between 1/3 and 1/2), reduce the oven heat to 250 F degrees. Continue baking (and stirring and scraping at regular intervals) until the mixture is thick, shiny, and the color of bricks, up to 2 or 3 more hours. If you don't have an oven or are simply willing to be around to monitor and stir the pot very regularly for a few hours, reducing tomato paste on the stove isn't a big deal. At Step 5, above, simply keep simmering the tomatoes. You want a very low and steady simmer and you need to check on the tomatoes and stir them every 20 minutes or so, being sure to scrape down the sides of the pot as the mixture goes lower and lower. Checking it regularly is key to keeping it from scorching, as is cooking it in as heavy a pot as you can find. An enameled cast iron pot and a set timer to remind you to stir are ideal. The whole process will take several hours—it really depends on how juicy the tomatoes are. Feel free to turn off the stove if you need to leave and do an errand and turn the stove back on when you come home. Once you have cooked the tomatoes into a thick, delicious paste, transfer it into several half-pint jars. You can keep it in the refrigerator or process the jars in a hot-water bath for keeping them shelf-stable. Use a flexible rubber or silicone spatula to transfer the tomato paste into jars. You will have 2 to 3 cups. Leave room at the top of each jar to pour a thick layer of olive oil to protect the paste. Cover with lids and store for up to several months in the refrigerator. Each time you use some, make sure the surface of the tomato paste is again covered with oil. To reduce the chance of mold developing, make sure to use scrupulously clean utensils every time you remove a dab of tomato paste from the jar. Bring a canning kettle of water to a boil. Use a flexible rubber or silicone spatula to transfer the mixture into sterilized, hot, pint- or half-pint jars, leaving 1/2-inch head space in each jar and running a thin knife along the sides of each jar to release as many air bubbles as possible. Pounding the jars on a counter a few times to try and get inevitable air bubbles out of the thick mixture works well. Put sterile lids that have been softened for a few minutes in hot water and patted dry on the jars. Set the jars in a canning rack and submerge in the boiling water of the canning kettle (making sure the boiling water covers the jars by at least an inch) for 30 minutes. Remove and let cool to room temperature. Store in a cool, dark place (a pantry or cupboard is fine) for up to 1 year. Once opened, store in the fridge and, as with the unprocessed jars, use clean utensils for removing tomato paste from the jar to reduce the risk of mold developing.